What is the Meaning of Don't Fight the Fed? What is the Meaning of 'Don't Fight the Fed'? You may have heard the old investing mantra, "Don't fight the Fed." But what does it mean? Is this generally good advice for all investors? 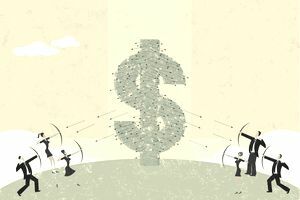 As with most investing mantras and phrases, there are some applications of this saying about the Federal Reserve Board's policies but most investors are wise to base all of their investment decisions on their own financial goals. What "don't fight the Fed" means is that, based on historical averages, investors can do well to invest in a way that aligns with current monetary policies of the Federal Reserve Board, rather than against them. For example, the saying suggests an investor should stay fully invested (up to their respective risk tolerance, of course) when the Fed is actively lowering interest rates or keeping them low. So an investor with a high tolerance for risk may be comfortable allocating 100% of their portfolio to stock funds when the Fed monetary policy is "easing" or "accommodative." The reasoning is that, in a low rate environment, corporations can borrow money more cheaply, which often translates into more profit as they invest the borrowed money to grow their enterprise (i.e. improve processes and increase productivity through the purchase of technology), or simply to refinance debt from higher rates to lower rates, thus increasing revenue by decreasing expenses. Hence, corporate stocks do well when their Fed-induced balance sheets are strong. When the Fed starts to raise rates, it does so to prevent the economy from overheating, which could then fuel higher rates of inflation. Rising rates also coincides with the late phase of the business cycle, which immediately precedes a bear market and recession of a growth cycle (and hence closer to a bear market and recession). Therefore, a bull market for stocks typically peaks before the economy peaks. This is because the stock market is a forward-looking mechanism or "discounting mechanism." To summarize, you would be "fighting the Fed," so to speak, if you remained fully invested when the Federal Reserve is raising interest rates or if you are conservatively invested when they are lowering rates or keeping them low. But the idea is NOT to fight the Fed! Therefore stick with stocks when the Fed is lowering rates and shift away from them when rates begin rising again. In contrast to the market and investors, the economy, or more accurate to say, the Fed and other economists, look backward. They are looking at historical data, usually one to three months back, to provide measurements of economic health. For example, if an economic recession began today, it would not be reported by economists with certainty for at least one month (or even three months or more if you factor in their revisions). Now consider that the average duration (length) of a bear market for stocks is one year. By the time economists herald the news that a recession has begun, the bear market may have already been in place for three or four months, and if it's below average in duration, it may be time to start buying back into stocks. This is why the stock market has been called a "leading economic indicator" because it can (but not always) predict the near-term future direction for the economy. This leads back to the original theme of this article, "Don't fight the Fed." Although the economy and stock market can continue to grow and move higher when the Federal Reserve begins raising interest rates, investors often look ahead to the next phase. In this case, the next phase is recession and investors don't want to get caught being exposed to riskier assets in a recessionary period. For example there are certain bond funds that do well when interest rates are rising and some investors may want to avoid the worst bond funds for rising interest rates. Similarly, when the Fed is lowering interest rates, the economy can be in recession and stock prices can continue falling. However, a growth phase and bull market may be just around the corner. In different words, a new bear market for stocks can begin even as the economy continues to grow. In fact, by the time the Federal Reserve officially announces a recession has begun, it could be a good time to get more aggressive and start putting more of your investment dollars into stocks. In summary, and to repeat, to be successful at not fighting the Fed, you invest more aggressively when they are lowering interest rates and you invest more conservatively when they are raising interest rates. However, it is important to note that prices for stocks can (and often) continue rising after the Fed starts tightening its policy with higher rates. The rise in rates, therefore, is simply a signal that the bull market is closer to the end than the beginning. More importantly, investors are wise not to guess the direction of stock prices or the economy based upon policies of the Federal Reserve. Their actions, or lack of action, are but one of many factors that influence stock prices. Which Are the Best Bond Funds to Buy When Interest Rates Are Rising? What Should You Do When the Market Tanks? Why Analyze the S&P 500 P/E Ratio?